We’re excited to introduce the brand-new Live Certificate of insurance, a feature designed to give Next Insurance policyholders instant, shareable, proof of insurance. Next Insurance customers can now quickly and easily access an online Live Certificate. They can then email it or share a link with anyone they like as verifiable proof of an active insurance policy. The Live Certificate enables entrepreneurs to optimize their work, spending more time focused on their business, and less time on managing certificates of insurance. The Next Insurance Live Certificate eliminates the possibility of fraudulent certificates and injecting transparency and confidence into the relationship between small businesses and their customers. Many states have passed laws to eliminate fraud in certificates and the Next Insurance Live Certificate is a significant step towards increasing trust between businesses and their customers. The Next Insurance Live Certificate provides digital real-time policy validation from any computer or mobile phone, giving anyone employing small businesses confidence that those they work with have active insurance coverage. 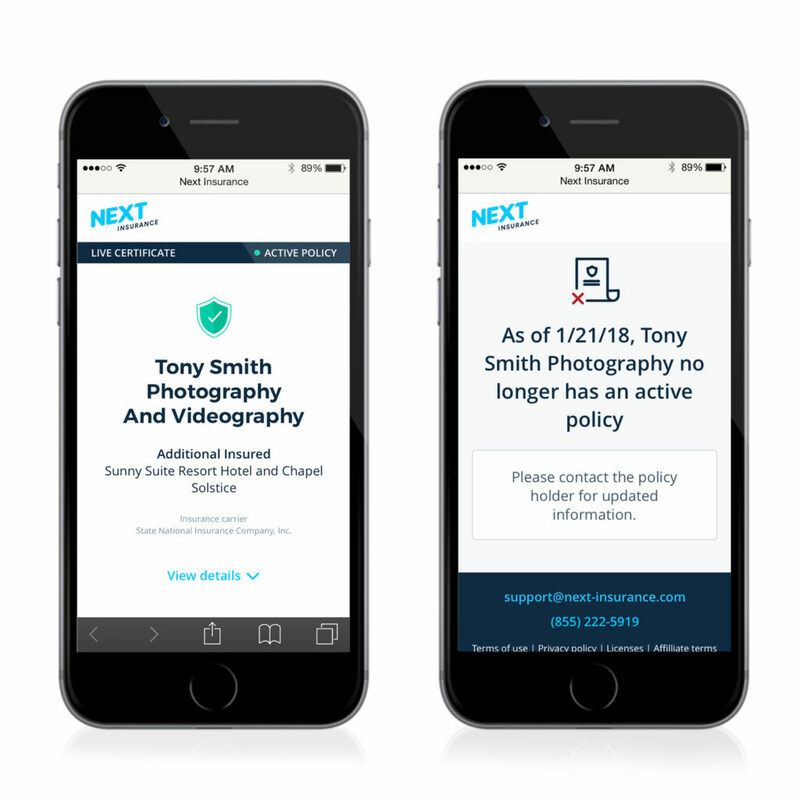 Next Insurance serves as a verifying third party, injecting transparency and confidence into the relationship between small businesses and their customers. From today, consumers working with small businesses who are Next Insurance policyholders will be able to quickly and easily check that the business they are working with has an active Live Certificate, ensuring confidence throughout the business relationship and assisting Next Insurance customers to move new contracts forward with speed. Business owners used to request certificates of insurance by mail, or in the best of cases, save online and print their certificates of insurance, giving them out as needed or requested. Times have changed and businesses no longer have weeks to wait for a piece of paper. Next Insurance policy holders can forget about all of that with the Live Certificate. From now on, getting a certificate of insurance–and sending it to anyone who needs it–is easy, instant, and free. No paper, no waiting, and no cost, either. Unlimited certificates are free to all Next Insurance customers–as are Additional Insured. By presenting a digital Live Certificate, Next Insurance customers also gain an edge over their competition, showing that they take their business seriously and have taken steps to protect both the business and those who work with them. In today’s competitive market, a Live Certificate offers a significant advantage over other businesses who might still be using paper certificates which can take weeks to generate. Live Certificates will contain all information about a policy held by a customer, including limits, business address, and more. Additional questions about the Live Certificate and how it can be used by consumers as well as by our customers can be found in our Live Certificate FAQ.